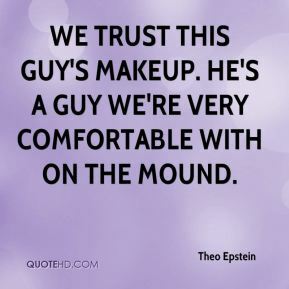 We trust this guy's makeup. He's a guy we're very comfortable with on the mound. 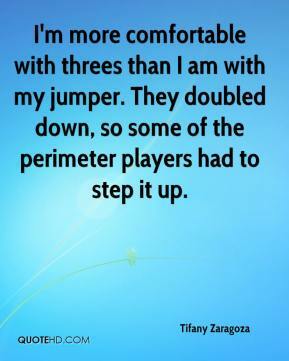 I'm more comfortable with threes than I am with my jumper. They doubled down, so some of the perimeter players had to step it up. 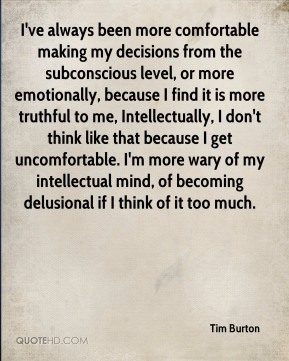 I've always been more comfortable making my decisions from the subconscious level, or more emotionally, because I find it is more truthful to me, Intellectually, I don't think like that because I get uncomfortable. I'm more wary of my intellectual mind, of becoming delusional if I think of it too much. I want him to feel comfortable and ride this out for a while and get a little further into the season. 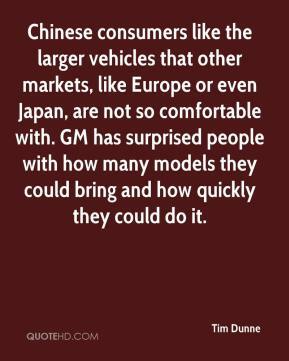 Chinese consumers like the larger vehicles that other markets, like Europe or even Japan, are not so comfortable with. GM has surprised people with how many models they could bring and how quickly they could do it. 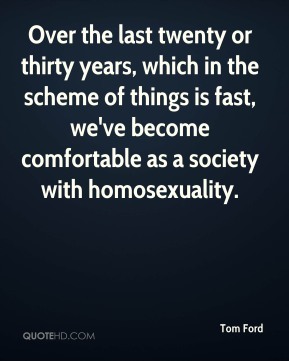 Over the last twenty or thirty years, which in the scheme of things is fast, we've become comfortable as a society with homosexuality. 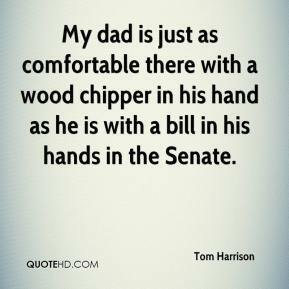 My dad is just as comfortable there with a wood chipper in his hand as he is with a bill in his hands in the Senate. 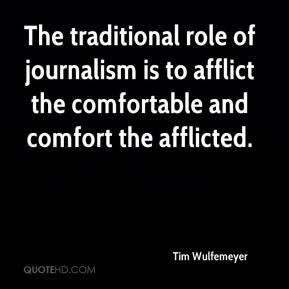 The traditional role of journalism is to afflict the comfortable and comfort the afflicted. We finally turned the corner on business expectations. 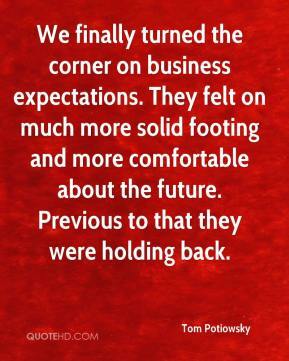 They felt on much more solid footing and more comfortable about the future. Previous to that they were holding back. 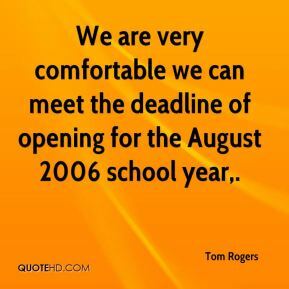 We are very comfortable we can meet the deadline of opening for the August 2006 school year. Public comments at the last board meeting suggested parents would feel more comfortable if there was more specificity on what?s covered. The curriculum is what it is, the result of work that?s been done over the last two years. This (new piece) allows the community to see exactly what would be taught in the classroom. 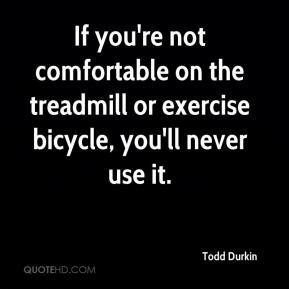 If you're not comfortable on the treadmill or exercise bicycle, you'll never use it. Heather had a great weekend. I think she has really settled into a comfortable role. 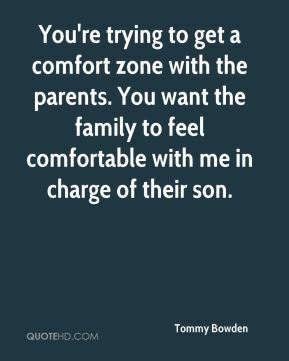 You're trying to get a comfort zone with the parents. You want the family to feel comfortable with me in charge of their son. I would think so. Like a fine wine, you get better with age. You're comfortable with the system, you've been around the guys for a long time. I worked real hard this off-season. I was really kind of getting back to working on my release and my feet. 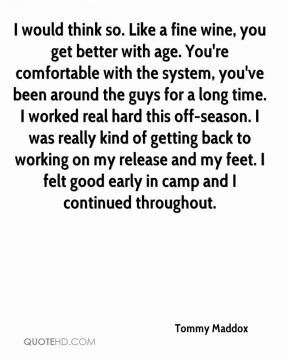 I felt good early in camp and I continued throughout. I do feel more comfortable over there. I go there and feel like, 'I can win this week.' I want to feel like that over here, too. There's no doubt, this is the toughest tour to win on, and the fields at the top are always much more bunched. 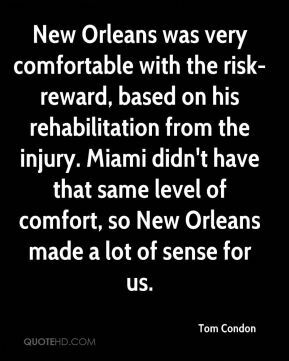 New Orleans was very comfortable with the risk-reward, based on his rehabilitation from the injury. Miami didn't have that same level of comfort, so New Orleans made a lot of sense for us. 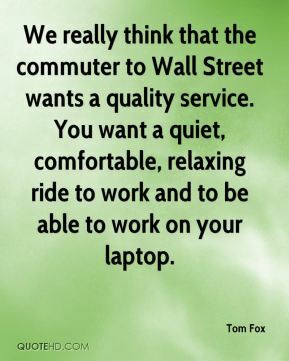 We really think that the commuter to Wall Street wants a quality service. You want a quiet, comfortable, relaxing ride to work and to be able to work on your laptop. 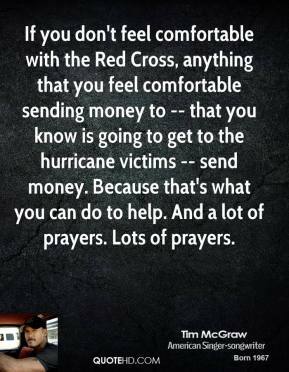 If you don't feel comfortable with the Red Cross, anything that you feel comfortable sending money to -- that you know is going to get to the hurricane victims -- send money. Because that's what you can do to help. And a lot of prayers. Lots of prayers. Clearly people have an appetite for change. The issue was, were they comfortable with change that the Conservatives would bring. Harper has purposefully defanged his platform in a way to make that change appear not so threatening. And they're comfortable with themselves. 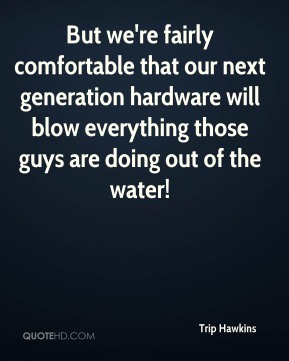 But we're fairly comfortable that our next generation hardware will blow everything those guys are doing out of the water! 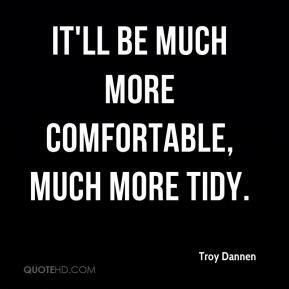 It'll be much more comfortable, much more tidy. I think just being a little bit more comfortable with the surroundings. Just knowing where the gym is, where the wrestling room is, can help us down the road. We like doing things independently; we're just into making clothes that are funny and comfortable.